I often will tweak a recipe to make it my own. This recipe is a result of tweaking. Last summer we received some rhubarb. 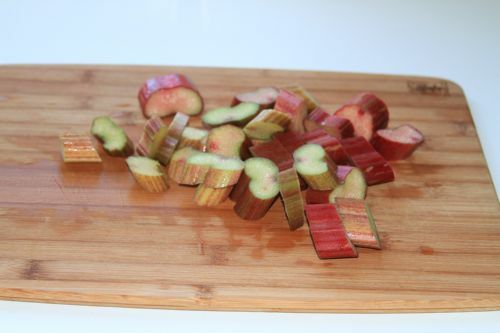 I know there are people who don’t like rhubarb, but read on… it’s not overpowering. Well, several months later, it’s time for fresh fruit again! I have two versions, one with sugar and one with sugar/Splenda mixture. For this post, I am using the sugar/Splenda mix. Yes, the picture has sugar instead of the Splenda Sugar Blend for Baking. I changed my mind when I made this… please forgive me. 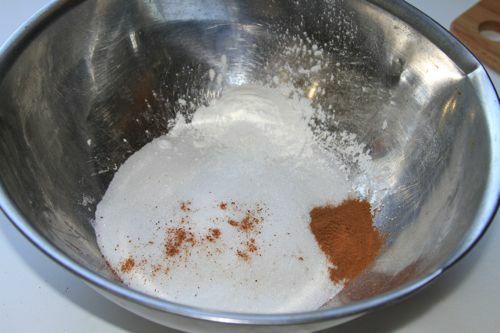 For the base, in a large bowl, mix the Splenda-Sugar, cornstarch, cinnamon and nutmeg together. 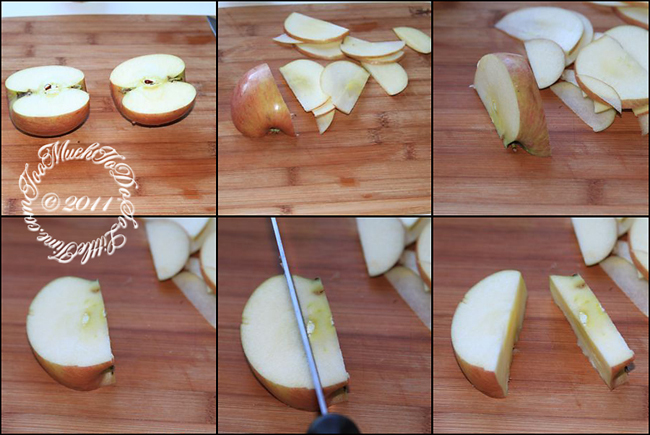 Core and thinly slice apples and put in bowl with rhubarb. Add blueberries to other fruit and toss/mix to distribute fruit and Splenda-Sugar mixture. 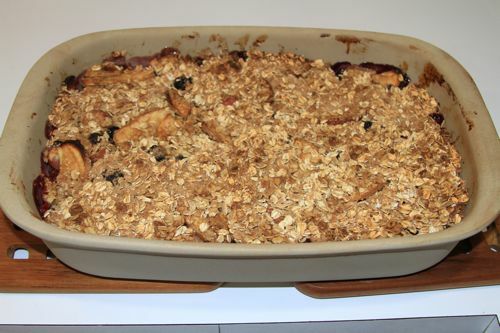 Pour fruit mixture into a 9×13 inch glass baking dish. I use my Pampered Chef rectangular baker. 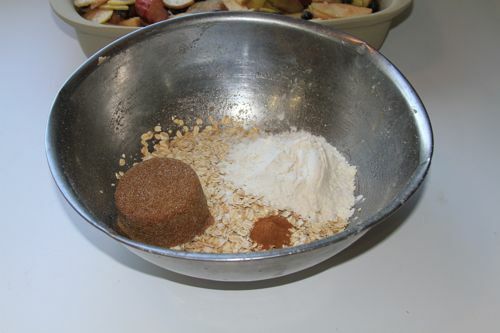 For topping, in a large bowl, combine oatmeal, flour, Splenda-brown sugar and cinnamon together. 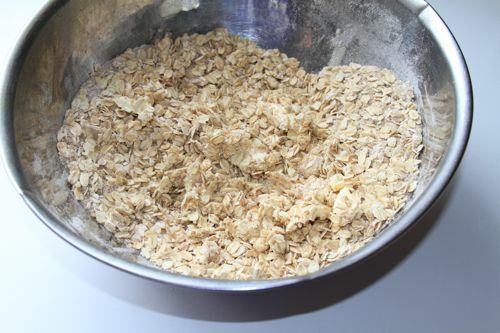 Add small pats of Smart Balance and cut into the flour mixture until it looks crumbly, (no big chunks). 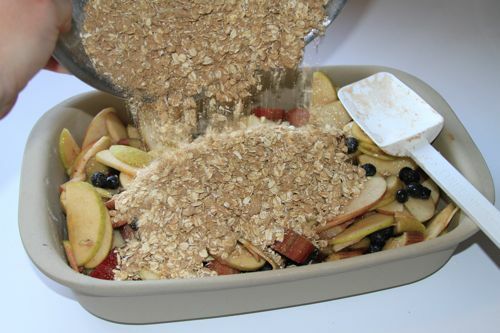 Pour oatmeal/sugar/butter mixture over the fruit. Bake at 400 degrees F (175 degrees C) for 30-35 minutes or until topping is brown. 1. Preheat oven to 400 degrees F (175 degrees C). 2. 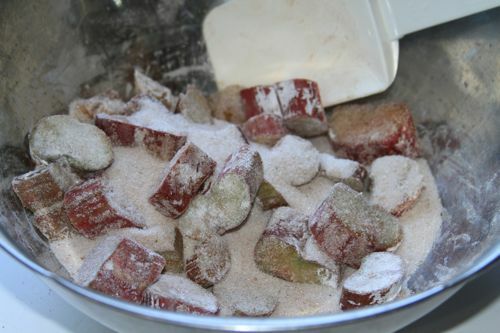 In a large bowl, mix the Splenda-Sugar, cornstarch, cinnamon and nutmeg together. 3. 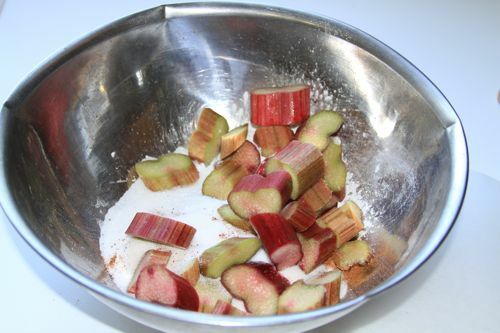 Cut rhubarb into one 1 inch pieces and add to bowl with Splenda-Sugar mixture. 4. Core and thinly slice apples and put in bowl with rhubarb. 5. 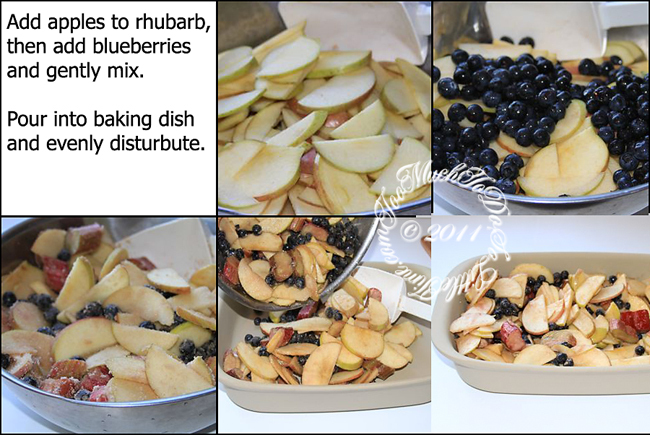 Add blueberries to other fruit and toss/mix to distribute fruit and Splenda-Sugar mixture. 6. 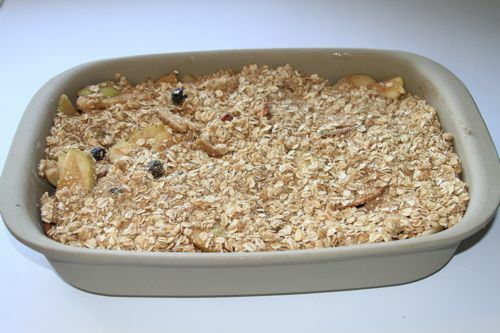 Pour fruit mixture into a 9×13 inch glass baking dish. 7. 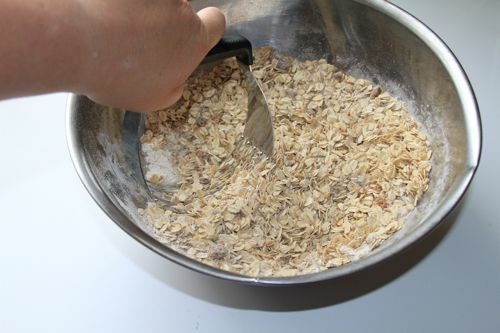 In a large bowl, combine oatmeal, flour, Splenda-brown sugar and 1/2 teaspoon cinnamon together. 8. Add small pats of Smart Balance and cut into the flour mixture until it looks crumbly, (no big chunks). 9. 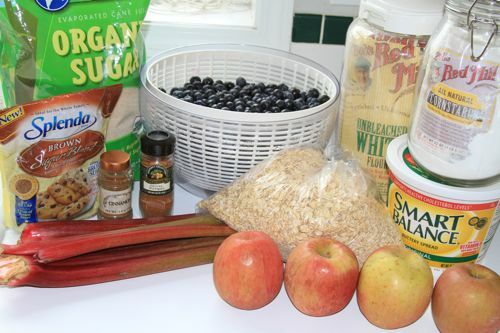 Pour oatmeal/sugar/butter mixture over the fruit. 10. Bake at 400 degrees F (175 degrees C) for 30-35 minutes or until topping is brown. 11. Serve warm. It’s even better with a scoop of vanilla ice cream. 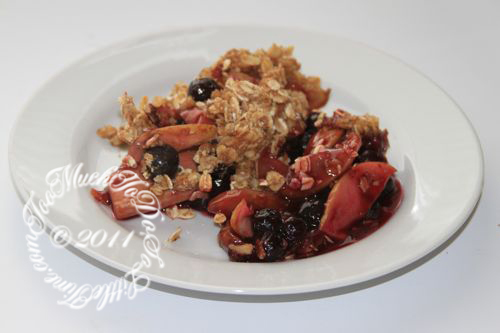 NOTE: Rhubarb may be a bit tart… squish it a bit with the warm blueberry and apple juice. YUMMMMM!